Enjoy The Enchanted Hill as the sun bids adieu for the night. 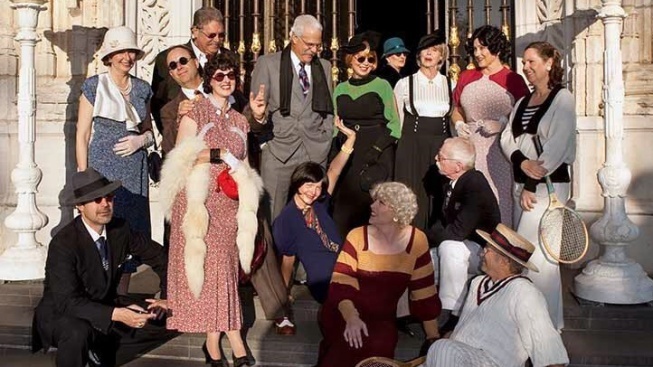 Living history docents in '30s-era garb will be on the 100-minute tour, oh la la. THEY'RE BACK, for the spring season, so book your spot and learn more about William Randolph Hearst, his companion Marion Davies, his many celebrity guests, and plenty of facts about the structures and their treasures. "Tours are 100 minutes long and feature a nice combination of the areas typically shown on our 3 main daytime tours," reveals a Facebook post, and the "...tours have the added benefit of our Living History docents dressed in 1930s costume who are stationed around the estate as if they were all invited up to a party put on by Mr. Hearst and Ms. Davies." An adult ticket is $36, and child's ticket is $18, and the tours are available in March, April, and May. Have you ever experienced a soft twilight, at The Enchanted Hill, on a soft April evening? While learning a lot about history, real-life characters, and architecture? Here's your chance.